Getting an online master's degree in accounting can demonstrate to employers that a graduate is committed to the world of business and finance. According to a report from the American Institute of Certified Public Accountants, CPA firms between 2012 and 2014 increased their hiring of master's degree program graduates by 11 percent. A master's degree in accounting can expose someone with an interest in accounting to careers such as a certified public accountant, a financial advisor, a budget analyst and other jobs that assist companies and people with finances, taxes and spending. Learn how higher accounting education can help current professionals advance in their chosen field. Many online degree programs exist that help to better suit the time commitments and budgets of students. Prospective students just beginning their school search should consider criteria like cost, graduation rate and student-to-teacher ratios when selecting a degree program. Below are some of the best accredited online accounting graduate programs. Students who wish to enroll in the masters of accounting in Creighton University will be able to pave their way to sit in the CPA exams after the completion of the course. Administered by the Department of Accounting by the Heider College, this non-thesis individualized program will help students learn principles of accounting and business ethics-all of which will be taught within a total 150-hours of lesson time. This is also the requirement for students who want to qualify for the CPA exam. Aside from the required course work, students are also required to engage in two co-curricular activities that include active participation in business organizations and service participation. The MBA program in accounting provided by the Baker College is geared for working managers who have already taken up undergraduate accounting degrees. It has received special accreditations through the International Assembly for College Business Education. Students will learn advanced accounting classes that are designed to fit practical work scenarios. The program combines both conventional and field-based training in order to produce graduates that are well-versed in both accounting theories and applications. The curriculum requires enrollees to have at least 16-quarter hours of undergraduate accounting which should include subjects like principles of accounting and intermediate accounting before they are admitted. Students may opt for regular classes or take the online classes. Being the first of the 18 accounting programs accredited by the Association to Advance Collegiate Schools of Business (AASCB)—the highest honor that is given to business schools. The University of Alabama Collat School of Business provides a good place for advanced studies. The master of accountancy program is designed for students who hold BS degrees in accountancy and those who want to prepare for the CPA exam. The MAC program is offered primarily as evening classes but students also have the option to take the online course or a combination of both. The program focuses on internal auditing and students are taught hands-on learning experiences through internship programs. The course also provides an annual Meet the Employers event that allows students to fast-track their career through employer matching. Sponsored by the National Association of State Boards of Accountancy and accredited by the Accreditation Council for Business School and Programs, the Webster University offers Master in Forensic Accountancy. Students who are taking this course can qualify for a CPE credit that can help them land jobs as internal auditors, forensic analysts, and valuators to investigate financial frauds. Private and public offices like the US Postal Services, CIA, and FBI require graduates from this program. This course is designed as an evening program thus it caters to working professionals. Students can take the course full-time or part-time for the fall enrollment and will take between five and seven semesters to complete. Managed by the Monte Ahuja College of Business, the master of accountancy program from Cleveland State University is accredited by the Association to Advance Collegiate Schools of Business (AASCB) which makes this university the first in Ohio to receive one. Students who enroll in this program learn about tax and financial auditing. The goal of the program is to prepare students for careers in internal audit, business, consulting, and public accounting. A large number of graduates become CPAs, but others venture into careers like CMA, CIA, and CISA. The program accommodates both full-time and part-time students. Students need to complete 60 units to finish the entire program. When researching online master's degree programs, students may struggle to find unbiased comparisons between schools. This search tool is an easy way for students to explore online programs sorted by student population, location, acceptance rate and type of institution. 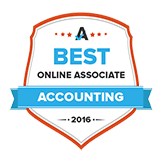 Getting a graduate degree in accounting requires a bachelor's degree and prerequisite experience with business and accounting. Once this work has been completed, online program students can take classes in their spare time. Even as part-time students, it can take as little as a year or two to graduate. Master's programs explore basic accounting principles in more depth and also include elective and optional classes for different specializations in finance, business, auditing, or certified public accountancy work. Online programs result in the same degrees as on-campus master's in accounting programs, but they can be less of a time commitment and less expensive. The course of study is just as rigorous, however, and students should be prepared beforehand to deal with complicated topics in accounting, finance, business and management. Since master's programs build on previous accounting knowledge, applicants must have experience in this area of study. Some master's programs have "bridge" programs for applicants who hold undergraduate degrees in a field that is not accounting where students can take prerequisite accounting and business courses through another online program at the same college. Other programs insist on a bachelor's in accounting, business or a related field. Online master's programs often take a holistic approach in their application process. Admissions committees consider academic background and test scores, but they also look at work experience and recommendations from people who know the applicant. Letters of recommendation should come from employers, clients and/or professors. The Graduate Management Admissions Test (GMAT) is a required standardized exam for master's in accounting program applicants. The exam may be waived if an applicant has a bachelor's degree from an accredited accounting program and a high GPA from that program. Applicants should have every college they have attended send an official transcript to the online master's program they are applying to; transcripts mailed directly by a student are not considered official. Programs want applicants to articulate what they expect to get out of a master's degree and where they want to go with that degree. This statement is usually one to two pages and quickly summarizes an applicant's vision for his or her future. Through rigorous coursework, master's in accounting student should learn high-level accounting principles in topics like ethics, technology and finance. Oftentimes, programs will offer students the opportunity to participate in networking events in the local community, allowing students to make the connections that will be necessary when it comes time for job hunting. Some programs give students the chance to volunteer their accounting skills in the community, assisting underprivileged individuals with tax returns and financial help. These events allow students to hone their newly acquired skills in real-life practice while giving back to their communities. Some online degree programs offer professional opportunities to their students. These internships are an opportunity for students to use what they have learned about accounting and to gain financial advising experience in a professional setting. Graduation requirements vary slightly among programs, and some aspects of graduating, such as final exams, are the student's responsibility. Programs may require students to spend some time on campus to meet fellow students, interact with potential employers and build a sense of community with other graduating accountants. Ultimately, online master's in accounting programs result in the same degrees and provide similar knowledge, skills and deeper learning opportunities as on-campus degrees. Students have to maintain a certain grade point average and meet their minimum requirements to pass classes and fulfill all credit hours. Some programs' credit hours fulfil CPA experience requirements, and graduates will be able to sit for the state CPA exam without needing to complete further accounting work. Online degree programs have a core series of classes all students must take to graduate, but some offer optional elective classes where students can focus on areas of accounting, business or finance. Maintaining good grades in these classes demonstrates a commitment to this narrower area of study. If an online program requires a final exam, it must be proctored. The role of the proctor can be filled by an employer, HR person, local librarian or local testing center employee. The proctoring fee is the student's responsibility. Many master's in accounting graduates become certified public accountants after graduation. Master's degree programs prepare students with the knowledge, experience and speaking skills to pass a standard certified public accountant exam in the state in which they want to work. Getting a master's in accounting opens up a range of career opportunities in the fields of business, finance and taxes. Companies and people both need tax advice and financial guidance from experienced professionals. For master's program graduates who are looking to build an even more specialized business and accounting skillset within their chosen field, further training opportunities exist. A master's degree, however, is a great way to help acquire an advanced career in the financial industry. Below is a list of potential careers available to graduates with a master's in accounting. Because tax laws are so complex, companies hire financial examiners to ensure they are following all laws governing financial institutions and transactions. Financial analysts assess stocks, bonds and other investments and help guide individuals and businesses in making strong financial investment decisions. Accountants and auditors prepare and examine records, verify their accuracy, make sure taxes are filed on time and assess financial operations to ensure organizations are running efficiently or individuals are reaching their full financial potential. Companies hire budget analysts to keep an eye on institutional finances and spending, prepare budget reports and make sure all budgets comply with government regulations. Whether employed by the finance industry or self-employed, personal financial advisors use their financial planning experience to provide clients with advice on topics ranging from taxes and investments to college savings and mortgages. Working in industries from accounting to entertainment, financial managers keep investments in order and help people and companies plan for their financial future. With the increasing amount of technology used in everyday processes, accountants will learn to understand the databases, computing tools and other number-crunching applications necessary to their field. Master's classes handle advanced techniques and accounting technology resources, as well as study emerging technologies and their impacts on process. Students should already have a basic understanding of accounting before entering a master's program. Master's degree classes delve deeper into financial accounting theory, current reporting problems and tools and resources to address those problems. Master's programs explore federal taxes and tax policy issues and also teach students how to find reputable, informative sources on these subjects. A master's degree is often just the first step toward an advanced career in accounting. If students narrow their focus to finance, accounting, market analysis or another area of business, they can find specific education and advancement resources available in these various fields. Additional resources are also available for minorities in the accounting industry, including women, African-Americans and American Indians. State-level organizations provide the educational resources certified public accountants need to maintain their state certifications, but this society offers training, professional skills, programs, services, scholarships and information on a national level. This international society administers certifications that are globally-recognized credentials in the finance industry and offers networking opportunities for corporate finance professionals around the world. Members of this organization gain access to higher learning courses, career resources and a community of peers interested in financial analysis. Their professional and graduate-level certificate programs showcase a student's experience in the investment industry. Women looking for scholarships to pursue an accounting education will find resources through this institution, which supports women's education, research, careers and publications in the accounting profession. This regulatory body protects investors and the financial market by regulating the securities industry. Anyone dealing in stocks or futures trading must go through the training and registration this organization has established to enforce high ethical industry standards. Members of this association can access education, development and career resources. Scholarships and other programs for African-Americans pursuing accounting careers are also available. In addition, this organization provides a group for women in the accounting industry and student programs for professional development. This organization works to economically advance American Indian and Alaska Native communities by establishing fiscal policies in governance and financial management. Educational resources are also available, including a forthcoming year-long program for students interested in American Indian financial policy, a Tribal Financial Manager Certificate Program, and featured scholarships and internships that American Indian and Native students can apply for to fund their business and accounting educations.